This is a movie that grows on you big-time. One of the reasons I Love You, Man works so well is that the characters are distinguished by extreme differences yet are believably committed to each other. One buddy liberates the other in this anything goes boys-will-be-boys comedy. 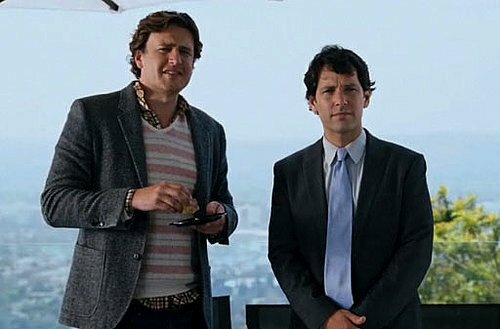 Paul Rudd (“Role Models”) and Jason Segel (“Forgetting Sarah Marshall”) star as the two guys marked by two decidedly different mindsets. Rudd is a square and uptight, and arguably effeminate realtor. Segel is hang-loose and impulsive, appears jobless and likely lives off a trust fund. On an embankment overlooking the Los Angeles cityscape, Zooey (the irresistible Rashida Jones from season three of “The Office”) accepts a marriage proposal from our doofus metrosexual hero Peter Klaven (Rudd). On the drive home, Zooey uses her speaker phone to announce to her friends that she’s engaged (!) which begins an untamed dialogue about how obedient and how generously selfless Peter performs in the bedroom – with Peter in earshot. The movie’s nerve is that Zooey, while perky and adorable, is the dominant power in the relationship. One of the problems is that Peter has always related more comfortably with female companions befitting of his non-threat and cutesy-sensitive demeanor. In an inspired awkward scenario, mom and girlfriends set Peter up with a series of man-dates to obtain a platonic friend for him, one that could hopefully stand as his best man at the wedding. One of them is disastrous when it is mistaken for a real date (Peter has to gargle thoroughly upon his return home). Poker night is disastrous when he pisses everybody off after holding onto an off-suited 7-2 that results as a blunder-luck play, and soon after abruptly throws up on the host after downing a beer. On his own, Peter meets the mentor-pal of his dreams in Sydney (Segel) at one of his open house property listings. Within two weeks, the two of them are hanging out full-time: surveying Los Angeles’ best fish tacos, garage band jamming, confiding in personal sexual preferences, and encouraging Peter to talk more like a man (“Why does everything I say sound like I’m a Leprechaun?”). Peter soon learns to act comfortably in his own skin and sling semi-vulgar jokes – nearly like a real man. Peter turns out to be just fine with getting in touch with his inner dirty boy. Friendship between two men craving to act like boys is a rite and a right, and yet the tension of the movie is how it dissolves the intimacy between Peter and Zooey – trust is especially gaped when he takes Sydney’s advice too literally to open up and express feelings and concerns in matters of the bedroom (Also, Don’t test your mate on why we are we together when you can’t answer it yourself). Plot detours include sight gags on overly demographic-friendly billboards and an embarrassing party toast that disgraces sanctity. Following a few obligatory obstacles – to the big wedding but the movie stays on course by keeping the comic tempo swift. In simple summation, “I Love You, Man” makes a bromance movie into a relatable experience and that is what makes it funnier as it goes along. 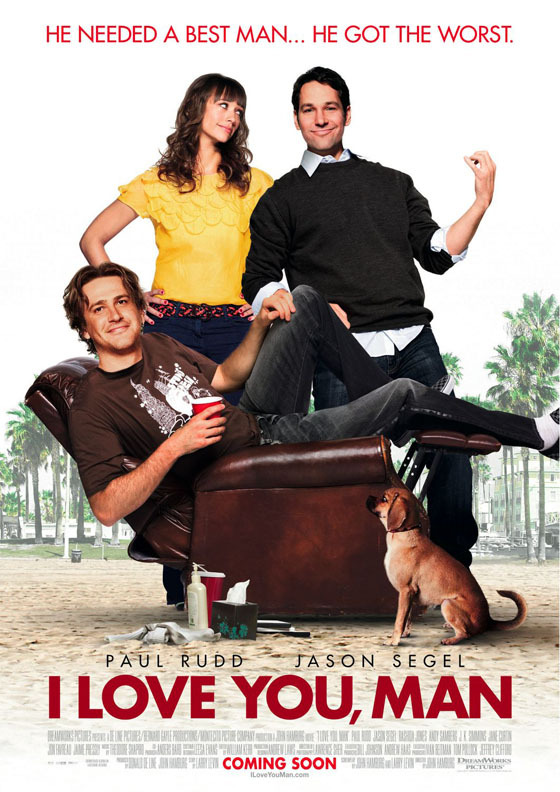 The movie also features chipper roles for J.K. Simmons and Jane Curtin as Peter’s parents, an exuberant turn by Andy Samberg as his brother, Thomas Lennon as Peter’s aggressively forward man-date, and Jaime Pressly and Sarah Burns as Zooey’s open-minded bridesmaids. Film Cousins: “I.Q.” (1994); “Clueless” (1995); “The Shape of Things” (2003); “Role Models” (2008).